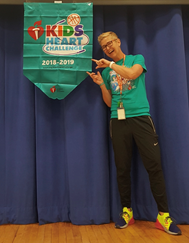 By now I’m sure you have all heard and read the important information about the Kids Heart Challenge! This is a big fundraiser not only for the American Heart Association, but also for the physical education program at Tashua School. Depending on the amount raised, the PE program gets money back to buy new equipment. Tashua School has our very own Heart hero! Jude Mathien is pictured below. Thank you all for your support! Students in all grades are doing a lot of jump roping in their classes. Beginning with jumping over a stationary rope to designing a routine with several tricks are just a few things that the students do in PE. Individual jump ropes and team long ropes are also included in this. There is something for everyone to do! I challenge the kids to see how long they can jump without a mistake. Other challenges are to see how many jumps you can do in 30 seconds. It’s called, “Hot Pepper!” Good luck!